With Claude Lanners the Computarium crew looses a second member in less than a year. After Jean-Claude's Asselborn lost battle against cancer, Claude Lanners had to retreat from the assaults of incurable ALS. We lost a most sympathetic member and a best friend. The following lines are an incomplete description of some aspects of his life and his achievements. Claude was born the 18th July 1939 in Dudelange close to the southern French border of Luxembourg. His father was a tailor which may explain his live-long skill in using the needle and garn. He made his secondary studies at the Lycée Classique of Echternach and at the Athénée in Luxembourg, where he graduated with a baccalaureat. After passing with success the entry competition for the civil service, he became a civil servant at Luxembourg's ministry of economy, where he retired in 2004 as an "inspector principal premier en rang" having reached the highest possible rank. He worked under many ministers and secretaries of economic affairs (like Paul Elvinger 1959-1964, Robert Goebbels 1984-1999, Henri Grethen 1999- 2004) and became one of the main persons in charge of promoting Luxembourg for foreign investors and companies. These were the years where Luxembourg's bureaucracy was lean and fast, and Claude was instrumental during his numerous travels in the United States in helping to attract well known companies and to push the badly needed industrial diversification of his country. He had a very quick grasp of all the intricacies and problems concerning investments and industrial work. When for example a company working in plastics choose to build a factory in Luxembourg, Claude became quickly an expert in multilayer foils and wrappings. Later Claude became a member of the board of administrators of for instance the SEO (a company operating a pumped storage plant) and a few others. He also was the treasurer of the research organization CRP Santé which specializes in health technology problems (see report of 2003). Claude was married to Mariette Eicher in 1963. They have two children (Martine and Michel) and 5 grand-children. Claude and Mariette were long-time members of the Luxembourg Youth Hostel organization, of which Mariette was the director for a time. They liked hiking and light mountaineering, an activity where our families often found together. 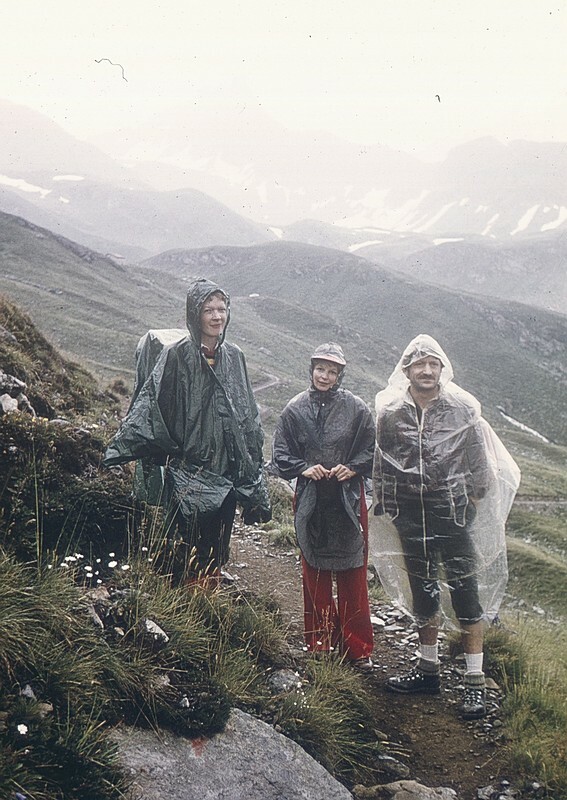 One of our first tours was in 1975 in the Austrian Verwall alps, a hiking experience mostly remembered for its bad weather. Claude was an avid and strong cyclist, making long tours in the country. His most cherished tee-shirt was a gift from his son and his daughter-in-law who participated in 1998 to the 26th Ragbrai , a seven day bicycle raid across the US state of Iowa totaling nearly 500 miles. During the last years before his illness, he often took his family to extended bicycle tours mixing fluvial boat travel and cycling. 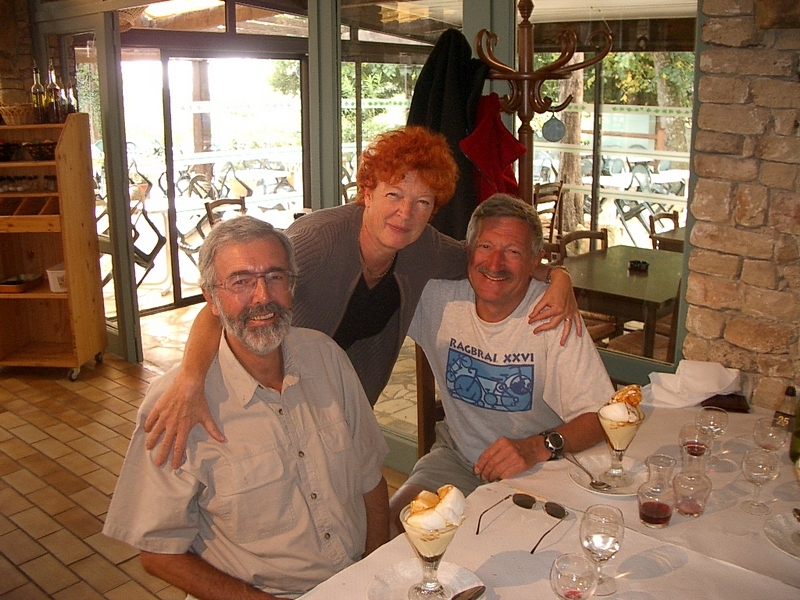 Francis Massen, Colette Heirendt and Claude in a French restaurant in 2003..
Claude shows his cherished Ragbrai teeshirt that he wore for practically 10 years up to the last thread. In 2005 the LCD held its 175th anniversary and a couple of people prepared for that event an exhibition of vintage calculators and computers (what later should evolve into the Computarium). During November 2005 we were asked to make a really large exhibition of working material in the mall of the shopping center Concorde in Luxembourg. Some heavy logistics was needed and I asked Claude for a helping hand in mounting the exhibition (which had to be done in a single afternoon.) Claude was present from start on, and when things really went out of hand and chaos raided its ugly face, he calmly managed to bring everybody down to flat earth and to put the collective work on a sure track, so that everything was ready just in time. In 2007 the Computarium participated to the Cirque des Sciences, sort of a huge multiple day Science Fair organized by the FNR (Fond National de la Recherche, Luxembourg's Research Fund). We had a big tent with many machines and many visitors, and again Claude excelled during the mounting, the running and dismounting of our equipment. Since many years Antoine Kies (from the former LPR laboratory of the University of Luxembourg) and myself are making radon measurements in an underground gallery beneath the reservoirs of the SEO pumping storage facility. Our experimental setup worked more or less correctly, but was an eye-sore, with computers and ancillary equipment strewn on the floor. When I took Claude to a visit he was truly horrified and quickly persuaded me that a more professional setup was in dire need. Together we worked for quite a time to tidy things up, to make concrete fittings where there were none and to install cabinets and correct lighting. Lower picture: nearly finished measuring station. With his retirement, Claude became interested in the history of the Lanners family. In his typical manner, he managed to establish a truly amazing genealogy going back well into the 17th century. He never was afraid of making quite long travels to consult archives, and he was keen taking the phone and ringing knowledgeable people all around the world. 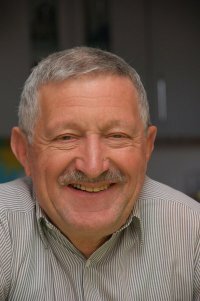 He became a member of Luxembourg's genealogical association Luxracines and together with his son Michel created an extraordinary website "The Lanners family". In a short time he managed to go back to 1679 to find his oldest known relative, and from that root on count over 13400 descendants. Sadly he had not the time to finish everything, but even in its current state the website makes fascinating readings, mixing text, photos and scans of old archives in an easy readable manner. About 6 years ago, Claude started to have some leg muscle problems. The first diagnosis were unconvincing, but after a while he was sure suffering from incurable ALS (Amyotrophic Lateral Sclerosis, or Lou Gehrig's Disease) which alas is still an incurable and fatal neuromuscular disease. Claude knew very well how this disease would evolve, but managed to keep good-humored and interested in everything. We often had long exchanges or talks on energy problems, and he was eager to be informed on Computarium matters. His wife Mariette made an admirable job in keeping his spirits high and enabling Claude a life that, even if wheelchair bound during the last 17 months, was still somehow bearable. Claude continued to help people whenever possible, and even 2 weeks before his passing away he gave my family good directions on private affairs. The unforgivable disease took up speed during the last weeks, and Claude could not win an impossible fight. He will be remembered by all his friends and acquaintances as a very intelligent, clever, witty and big-hearted person. Let his family find console in the lasting memories and in the many achievements that bear his signature.